« Who’s Winning the War? Amid the onslaught of media reports on the current security situation, the status of Pakistan’s Internally Displaced Persons (IDPs) should be cause for increasing concern. According to the United Nations High Commission for Refugees (UNHCR) in Pakistan, there were 462,912 internally displaced persons (IDPs) outside camps in NWFP, and 93,627 at IDP camps as of April 28. In CHUP’s recent interview with Khalid Aziz, director for institution-strengthening with the FATA Secretariat, the number of IDPs living throughout Pakistan [with their families, in camps, etc.] was totaled at 700,000. The militants are marching on the streets of the city, threatening the lives of civilians, local administrators, and security forces, according to the Pakistani military. Authorities in Swat lifted a curfew Tuesday between 1:30 and 7 p.m. to allow residents to leave the area, Swat District Coordination Officer Khushal Khan said. He noted that after Wednesday, “there will be no time” for evacuations. The NWFP government has announced they will set up six more camps for the influx of displaced persons, “in addition to existing camps in and around Peshawar,” reported CNN. Other NGOs like Helping Hands Relief and Development have also contributed to the efforts, telling local media that 500 displaced families had taken shelter in four temporary camps in Lower Dir based around school or college buildings. The United Nations, meanwhile, is increasing their efforts in collaboration with National Disaster Management Authority and other NGOs to provide humanitarian relief to these people. 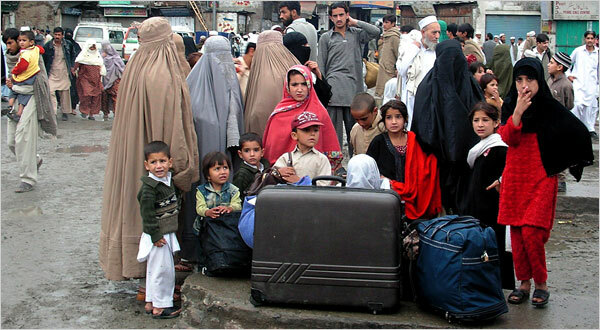 According to IRIN, “Around 1,000 families fleeing Buner and Dir districts for Jallozai camp near Peshawar have been given assistance. The camp currently accommodates some 7,800 families, most of them from the Bajaur Tribal Agency. Recently, on March 25, news agencies reported that an incident occurred when “some 1,500 IDPs at Jallozai camp in Nowshera, east of Peshawar, staged a rally and blocked a main highway. ” The people were protesting the poor facilities at the camp. Malik Said, one of the IDPs who led the protest, told IRIN over the phone: “We initially staged a demonstration inside the camp because we want better food, regular supplies of basic items so we can cook, and compensation for families who have lost relatives in the conflict.” However, as the protest blocked traffic, police in Nowshera shot at the crowd killing a protester. If you recall from CHUP’s recent coverage of Sharmeen Obaid Chinoy‘s film Children of the Taliban, these camps have been and will continue to be recruiting grounds for the Taliban, particularly if services are not provided by the government, and especially after developments like the one noted above. Within this vacuum, if the militants can provide services and offer more viable options for IDPs than the state, that is a dangerous phenomenon. The government and international agencies must therefore do more to relieve the plight of the ever-increasing number of displaced persons in Pakistan, not just for humanitarian purposes, but because we cannot afford to let the Taliban win anymore. As for us, it is important to remember that IDPs are not beggars living in tents. They are not just a statistic. They are people. And we must also play a role in helping their situation. I am currently compiling a list of methods for people to help, so please email me at changinguppakistan[at]gmail[dot]com if you have suggestions or leave a comment below. A CHUP reader kindly informed me that several people, including Fauzia Minallah and Ghazalah Minallah, the wife and sister of Athar Minallah, a prominent Pakistani lawyer, are collecting donations of flour, sugar, rice tea, dry milk, daal, ghee, salt biscuits for the IDPs who have poured into Islamabad/Rawalpindi from Buner and the adjacent areas. To donate and potentially help with the distribution of these items please call Fauzia (0306 504 9852) or Ghazalah (0300 527 0330). Thanks to a commentator who mentioned the Pakistani Red Crescent Society, who are supporting IDP’s in District Dir, Nowshera (now closed), Risalpur, Mardan and Swat. To make a donation or volunteer your time, call your provincial branch of the PRCS. Thanks to another commentator who recommended Islamic Relief USA, who provided a lot of earthquake relief and are now currently providing medicine and other essentials to IDPs in and around Peshawar. For people in the United States who would like to help, this may be the best avenue. Click here to get the contact information near you. Thanks to another CHUP reader who informed me that UNHCR has started a reliable online drive to collect funds, click here. There is a good breakdown on the website of what tangible items your funds will provide. YellO.pk has begun the process of marking Aid Collection Points around Pakistan where clothes, food, tents and donations are being collected for the displaced people of Swat, Buner and Lower Dir. They need your help to mobilize the efforts of those around you and make them aware about how they can mark the Collection Points as “Events” on the yellO map. Click here to mark a Collection point on the map or email idp@yello.pk with the Collection point details (location, telephone, timings, what to donate etc). Please encourage others to do the same and pass this message on to as many as you can. You can search or add your collection points on the website. In Islamabad, Mehnaz Ulmulk is collecting items like mattresses, bedding, mosquito repellants/coils, soap, plastic plates/cups, water coolers, etc. [not cash donations]. She has a friend who has been personally going to the camps to help out, so your items will go directly to the IDPs. Call her at +(92)300 5351887. Definitely also suggest contacting your local Edhi Foundation center and donating money that way. Click here to receive contact information for a center near you. The World Food Program (WFP) in Pakistan is currently reaching 650,000 IDPs, providing rations as the crisis worsens. Click here to donate money to their efforts. A food drive wil be held in Karachi at the Carlton Hotel from Friday May 15 – Sunday May 17. Click here to visit the Facebook event for the drive and to view further details. Kalsoom, based on past experiences (earthquake survivors, Afghan refugees etc.) I don’t think too much can be expected of the government. Citizens of Pakistan need to come together for this cause. We need to help the displaced. Not only were they already from the less developed regions, they are now homeless as well. In your opition, is the National Disaster Management Authority the best organization to contribute to? Who are the individuals you have listed that are accepting food items in Islamabad? What organization do they belong to? A little background might make your readers feel more comfortable. Not too much can be expected from the government, but that does not mean we SHOULD not demand these things. The state must understand the gravity of not just defeating militants but also not creating more in their wake. I agree though that real help should come from the civilians and the civil society, which is why I am trying to piece together a list for readers to donate and offer help. It’s really said to see that this is what has become of Pakistan. Increasing numbers of IDP’s can only create more frustration, and of course frustration. I hope that this won’t frustrate people who feel they are being burdened by this displaced people. Hopefully, Pakistan can stick together, and realize that our present civilian government is absolutely useless. They are sitting in Washington right now, talking to Obama. What’s the point? They have no leverage when discussing possible strategies. The army is the one that has all control. Helloo!? Its ridiculous. The only thing they can possibly do is campaign for funds to provide better living situations for the IDP’s. Maybe they can pull some cash out of their foreign bank accounts to help their country out. FR, I KNOW. Did you see the silly little interviews are doing all over DC? It’s ridiculous. Washington does not see them as legitimate let alone our own country. These IDP camps could very easily follow the examples of the camps in Uganda and the Palestinian territories. If the Pak govt fails to provide services the younger generation are very suceptible to recuirtment by extremists which will perpetuate the cycle of violence. I hope, but seriously doubt that AAZ will recognize the huge problem of IDPs and the consequences of having a high number of displaced, desperate and frustrated people w/i Pakistan’s borders. Very doubtful, and would be surprised if it even is a major issue addressed in his talks in Washington. Judging from Zardari’s interview with Wolf Blitzer yesterday, his primary goal is to just get money from the US – which is what we need desperately, the question is for what. Very little about the IDP situation was discussed, it was more about the battle against the Taliban. How very sad.. this is a very important time for everyone to think about donating to charitable causes aimed at helping the IDPs. Kalsoom, do you have a particular suggestion and/or link? Am trying to vet all these organizations. Someone emailed me to ask whether Helping Hands Relief and Development are good to donate to, and I’d say currently, no. I’m a little distrustful of any organization that you donate money online and there’s little or no transparency to where your money is going. I provided phone numbers of people in Islamabad that are accepting donations of flour, rice, tea, sugar, etc. but am vetting those as see who they’re affiliated with, what work they’ve done etc. H, will find out about Natl Disaster Management. I’ve emailed my contacts who are closer to the situation, since this is something we are getting more involved for work, so I can find out details soon and will post. What about the Pakistan Red Crescent? Thanks Saesneg, I mentioned it above. They are affiliated with the ICRC and are providing medical and food, etc. to the IDPs and look legit. I provided a link to a list of numbers to call. Personally, I’d call rather than donating directly to their bank account. I’ve been looking (well, googling) for UK based charities who might be fundraising here… So far coming up with blanks. Am going to do a post on it me thinks. Any pointers would be appreciated. Have you tried googling Islamic Relief in the UK? I know they’re legit and raising money in the US, but not sure about their activities in the UK. I’ll try to find out more and get back to you. They either haven’t updated their website or aren’t involved, which surprises me as they were during the 2005 earthquake. The massive new Islamic Relief shop in Cardiff, not far from where I live, is also not on their site, so I imagine it might be the former rather than the latter. Found a solution thanks to a CHUP reader, which I listed above. UNHCR is accepting donations, and you can list your country and they also have amounts to show how much $80 will provide, $100..etc. Thanks K! You’re doing great work…pass on the information whenever you have something so we can all do our part. They were very active in the judicial crisis. Ghazalah herself is a teacher of law while Fauzia works for the Funkor Child Art Center and has written an incredible book about the hidden treasures of Islamabad. He said he’ll find out more details about the distribution of these items and get back to me. K, thank you for this most urgent & important post . You are amazing…do you ever get to sleep. I mean between your regular job & writing every day on your Blog so all of us are connected to what’s going on in Pakistan. Tell us what to do to help, as non of us ( I am quite sure) would like to see our brothers & sisters from the FATA region suffer such humiliation. Remember, this could happen to any one of us, specially with the way Mr Zee’s govt is going about doing Politics as usual. Let’s fight back the Taliban with Humanitarian Aid & every thing else that is opposite of violence. And no, I don’t sleep very much at all 🙂 but I have a great boss and get to do awesome work so it all works out for the best. Khalid Aziz, who I interviewed two weeks ago, got back to my request about what individuals can do to help, and he informed me that his NGO, RIPORT, based in Peshawar, are also providing relief to the IDPs. I am providing the information on what they’re doing and how you can help in the post. Great post, Kalsoom. Thank you for shedding light on such a grave matter. Islamic Relief USA has been doing a lot of great work at the IDP camps in the outskirts of Peshawar–they have been providing meds and other essentials to those in need. Their website is: http://irw.org/. The saddest part of this whole situation is that nothing will really be done about it. For decades millions of people have gone without clean drinking water and food, I don’t see the government making a special effort in this case. I feel like most of the earthquake relief of ’05 was also done by citizens rather than the government. Thanks for the info on how to help, that was my first question when I started reading the article. I’ll pass on the information to whomever I can. During the earthquake there was a great movement in DC in the Pakistani community to get together tents, clothes and food. I have no doubt our community will come through for the IDPs as well. Thanks AF, I mentioned the contacts above! LM, I think the increased media attention (I listen to BBC World Radio at work and the story is literally every other minute) hopefully makes people snap into action. I think also if the IDPs see that their fellow Pakistani or non-Pakistani are helping, it will be really helpful for them to not feel so helpless and alone. I’m looking for people in Karachi who are involved in collecting and delivering relief goods to the north for all the IDPs in Peshawar, Islamabad and pindi. If you come across any kind of information please let me know so I can pass the message on. I’ll dig around and see if I can find anything for you! For those who wish to donate from Islamabad and adjoining areas, please contact Iqbal Bali 0323 534 3262 Fauzia Minallah 0306 504 9852 and theres a facebook group called zimmedar shehri which is also collecting clothes in lahore. This is always the ones the most affected by war,the women and children. If the Taliban really cares about the Pakistany people why do they seek to have such control over others both politically and religiously. This is not really about someones idea of God but how to selfishly have power over others at the expence of human lives. This is not what pleases God even though their are times to protect ourselves and our families from attack. Those who wage war for power and money are not truely walking after God or desire the truth of God our Creator. God was manifest in the flesh in the person of The Lord Jesus Christ. God sent his only begotten Son into the world to save sinners from their sins because he truely loved all of mankind enough to do it. He was born of a virgin,lived a sinless life,and died for all our sins on the cross 2000 years ago outside of Jerususulum, Israel. He was buried,and rose from the dead the third day,was seen of men,and went back up to heaven. His sinless blood was shed as the only atonement for sins God will accept. If we repent of our sins against God our Creator and trust Jesus Christ as our personal Saviour and God he will give to us his gift of eternal life through Jesus Christ our Lord. For by grace are ye saved through faith and that not of yourselves,it is the gift of God not of works lest any man should boast. (Ephesians 2:8-9).He alone can save us from our sins and change our hearts from sin wether murdur, adultury,thefts,rapes,drunkenness, or any other sin or sins including the worst unbelief. Believe on the Lord Jesus Christ and thou shalt be saved,and thy house. (Acts 16:31). Read the Authorized King James Holy Bible of 1611,the preserved word of God. For more information on this,www.fbn.org , http://www.thegospelhour.org , or http://www.pgm.org. Thank You,very much,and begin reading John and Romans on who Jesus really is. yellO.pk has started the process of marking Aid Collection Points around the country where clothes, food, tents and donations are being collected for the displaced people of Swat, Buner and Lower Dir. We need your help to mobilise the efforts of those around you and make them aware about how they can mark the Collection Points as “Events” on the yellO map. Go here to mark a Collection point on the map http://www.yello.pk/events/add or email idp@yello.pk with the Collection point details (location, telephone, timings, what to donate etc). Please encourage others to do the same and pass this message on to as many as you can. Will add it to the list! Thanks for your efforts! My Khala (Mom’s sister), has been researching on this issue for the past few weeks and has arranged for 2 trucks to leave Lahore at the end of next week. One truck is going to filled up with water supply and the other will have bedding & especially utensils. A lot of the families have fled into Mardan and since my Khala’s close friends live in Mardan, she has arranged for the two trucks to leave Lahore and head to Mardan at the end of next week. If you are currently in Lahore and would like donate money or supplies to fill up the trucks, she has requested for you to please contact me as soon as possible so I can put you in touch with her. My e-mail address is omarulhaq@gmail.com. PS: If you know of any Lahoris who might be interested in helping out … please pass on this link to them as well. Hellcrook says, “we are paying dolllllllllllllllllllllllars! Mush said, “Pakistani women …..
Why UNHCR has been assigned management role despite the fact that these unfortunate people are not refugees? Money does not seem a problem when everybody is begging anybody in the name of IDPs! Real problem is organization and management – the good general heading SSG may a have to show excellent reports but ground realities in earthquake hit areas do not match his claims. Nation must organize a volunteer corp managed by rep from academia, journalist, and almost every segment of society should have representation on BOG/BOD of VC. All donors including UN bodies, ngos, army and government officials should work within VC, only then this challenge can be met or we are doomed (may God forbid such a eventuality) – as we did in former east Pakistan. This huge internal displacement of refugees is injustice to such large numbers of people. Terrorists could have been tackled without a war. Although situation is very bad in Pakistan. There is growing fear and insecurity in Pakistan. Unfortunately Pakistan is under terrorist attack. Some people consider it civil war. It is not clear who is behind these attacks. love PAKISTAN and keep UNITED….and work for her development…. Thank for this wounderful work, I and every one should appreciate. I am also representing an organization “Support With Working Solutions”(SWWS) which work with pakistan Poverty alleviation Fund provided training opportunities to IDPs youth in five trades with cash stepend and tool kits for different trade. Arrange clean drinking water by installing dug well in two camps. Regulalry and continuoisely providing dairy milk to 9000 children, with family foos support to vulnerables 700 and 474.
this really sad that bieng a muslim nation we are killing our own brothers and sister …./. this is the saddest news …. people wake up and donate for your displaced brothers … who r waitting for your help … agencies are doing very good job but we should also stand for their help …. Love PAKISTAN and keep UNITED….and work for her development….Pakistan keep rocking forever!